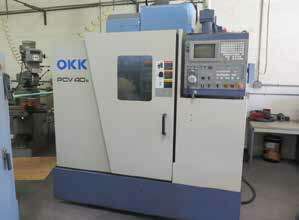 OKK PCV 40 II CNC Vertical Machining Center s/n 516 w/ OKK Neomatic Controls, 20-Station ATC, CAT-40 Taper Spindle, 16” x 28 ¼” Table, High Flow Coolant. OKK PCV40 CNC Vertical Machining Center s/n 505 w/ OKK PNC Controls, 18-Station ATC, CAT-40 Taper Spindle, 16” x 28 ½” Table, Coolant. Hitachi Seiki VA-35 CNC Vertical Machining Center s/n VA3023 (NEEDS WORK) w/ Fanuc System 6M Controls, 18-Station ATC, CAT-40 Taper Spindle, 12 ¼” x 39 ½” Table, Coolant. Hardinge CHNC CNC Chucker s/n CNC-485 w/ Hoffman Upgraded Controls, 8-Station Turret, Pneumatic 5C Collet Closer, Cutoff Slide, Part Chute, Bar Feed, Coolant. Station Main Turret, 8-Station Sub Turret, Hydraulic Tailstock, 8” 3-Jaw Power Chuck, 5C Collet Nose,Coolant. Hardinge CHNC CNC Chucker s/n CNC-127 w/ Allen Bradley 7370 Controls, 8-Station Turret, Pneumatic 5C Collet Closer, Cutoff Slide, Part Chute, Coolant. Dial Change RPM, 9” x 42” Table. Bridgeport Vertical Mill s/n 81998 w/ Anilam Spirit DRO, 1Hp Motor, 80-2720 RPM, 8-Speeds, Power Feed, 9” x 42” Table. Lagun Vertical Mill w/ 3Hp Motor, 58-4000 Dial Change RPM, Power Feed, R8 Spindle, 9” x 48” Table. Hardinge mdl. HC Hand Chucker w/ 8-Station Turret, Power Feeds, 5C Collet Closer, Coolant.